Marc Gasol was born on the 29th January 1985, in Barcelona, Spain, and is a professional basketball player, who currently plays centre in the NBA for the Memphis Grizzlies (2008- ), while he has also played for Barcelona (2003-2006) and Akasvayu Girona (2006-2008). Gasol is a Spanish League MVP (2008), two-time NBA All-Star (2012 and 2015), NBA Defensive Player of the Year (2013), and All-NBA First Team (2015). He also has two gold medals at the EuroBasket (2009 and 2011), and gold at the FIBA World Championship (2006). His career started in 2003. Have you ever wondered how rich Marc Gasol is, as of early 2017? According to authoritative sources, it has been estimated that Gasol’s net worth is as high as $20 million, an amount earned through his successful pro basketball career. Gasol’s annual salary is $14 million, and he also has sponsorship deals which have improved his wealth. 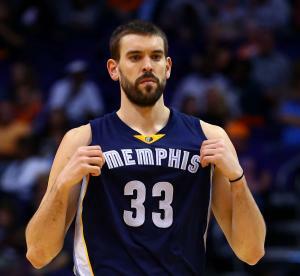 Marc Gasol grew up in Barcelona along with his brother Pau, but he moved with his family to the Memphis suburb of Germantown, Tennessee, when Pau started to play for the Grizzlies in 2001. He went to the Lausanne Collegiate School, where he played basketball and averaged 26 points, 13 rebounds, and six blocks per game in his senior season. Marc returned to Spain and played for Barcelona from 2003 to 2006, winning one league title in 2004. He then moved to Akasvayu Girona in 2006, and spent three years there, winning the Spanish League MVP award in 2008. The Los Angeles Lakers selected Gasol as the 48th overall pick in the 2007 NBA Draft, but the Lakers traded him to the Memphis Grizzlies in a package that included his brother Pau, which is a unique case in the NBA history, where the player was traded for his brother. Marc had a solid rookie season with the Grizzlies, averaging 11.9 points, 7.4 rebounds, and 1.1 blocks in 30.7 minutes per game. These numbers secured him a place in the NBA All-Rookie Second Team in 2009. The next season, Gasol saw increased minutes and averaged 14.6 points, a career-high 9.3 rebounds, 1.6 blocks, and one steal in 69 games. He started in all of 81 matches he played in the 2010-11 season, but his numbers declined a bit, averaging a career-low 11.7 points, seven rebounds, and 1.7 blocks. The Grizzlies made the playoffs and upset the San Antonio Spurs in the first round before losing to the Oklahoma City Thunder. In December 2011, Marc signed a fresh four-year deal with the Grizzlies, worth of $58 million, which only increased his net worth. He had a solid season and earned his first invitation to the All-Star game, where he represented the Western Conference. Memphis, however, failed to reach the second round of the post-season after losing to the Los Angeles Clippers. In the 2012-13 season, Gasol was rewarded with the NBA Defensive Player of the Year award, and was voted to the NBA All-Defensive Second Team and All-NBA Second Team that year. Marc ended the 2013-14 season averaging 14.6 points, 7.2 rebounds, 3.6 assists, 1.3 blocks, and 1.0 steals per game, while in 2014-15, he averaged a career-high 17.4 points in 81 games. Last season, Gasol missed 30 games with a broken right foot, which resulted in Memphis being swept by the San Antonio Spurs in the opening round of the playoffs. He averaged 16.6 points, 7.0 rebounds, 3.8 assists, and 1.0 blocks per game. Gasol has been quite successful playing with the Spain national team, which won the 2006 FIBA World Championship in Japan, 2009 EuroBasket in Poland, 2011 EuroBasket in Lithuania, and a silver medal in the 2008 Beijing and 2012 London Olympics. Most recently, Gasol won a bronze medal in the 2013 EuroBasket in Slovenia. Regarding his personal life, Marc Gasol has been married to Cristina Blesa since 2013 and has a daughter with her. He speaks three languages fluently. 1 Has a daughter named Julia (b. November 2014). 2 Brother of Pau Gasol.